Dette indlæg blev udgivet i About Somalia og tagget Charlie Chaplin, Somalia's plight, Speech den 15. december 2011 af Nasrin Billie. 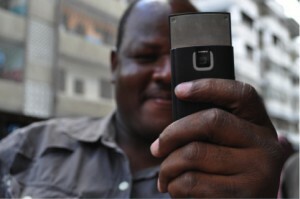 Access to mobile phones is booming in East Africa. This has seen a growth in social networking fueled by the transition from the PC to the mobile. Online communication is becoming the new trend, but does everyone benefit from this? The developing world’s share of mobile phone subscriptions increased 20% in 2010. In comparison, subscriptions increased by 1.6% in the developed world. According to the Tanzanian daily, The Citizen, 75% of the 42 million population will have access to a mobile phone within the next four years. The development of access to the internet in Tanzania as well as other East African countries has gone and is going fast, partly due to the access via mobile. Growth in social networking sites such as Twitter and Facebook has been fueled by the transition from the PC to the mobile. For example, access to Facebook via mobile phone in Kenya is relatively cheap (8 Kenyan shilling for 10 MB – ‘which is a little for lot’). Statistics show that mobile users in Kenya spend on average 3.1 hours per week on social networking sites compared to just 2.2 hours on email. What about the minority, who don’t have mobile phones? people with little or no education. The articles: ‘Is the ‘mobile phone revolution’ in Africa really for everybody?’ and ‘Mobile phones and the new ‘digital divide’’ couple the positive development with concerns. In a paper published by Audience Scapes, Gayatri Murthi acknowledges the unprecedented rapid increase of mobile phones in the developing world – but she goes on to show that gender and income disparities mean that by no means everybody is able to reap the benefits. Men are much more likely to have access to mobile phones than women. In East Africa, a woman is 23% less likely to own a mobile phone than a man. Unequal educational opportunities present another divide. For example, 93% of Kenyans with formal education had access to a mobile phone, as opposed to 50% of those without. Since a higher proportion of men than women have access to formal education, this reinforces the gender imbalance. Will new media and new technology liberate the people? The fact is that people in rural areas, women and the uneducated are less likely to receive information via mobile phone, relying more in interpersonal communication. This challenges assumptions that new technologies are in and of themselves, going to democratize the information environment. The advantages of new media lie in the ability to not only access information, where ever you might be, but also the ability to contribute with content. But the challenge remains though, that control over technique and access does not necessarily make good content. On the other hand, online communication facilitates the establishment of online communities. Political activism and civil journalism can be used to voice opinions that might otherwise be silenced if expressed off-line. The strongest case of this might be the role of Facebook to organize demonstrations in the Middle East. Dette indlæg blev udgivet i Media coverage, New media og tagget East Africa, Facebook, Mobile phones, Online communities, Social media, Twitter den 9. december 2011 af Nasrin Billie. Somali people have been fleeing violence and famine for over 20 years. This has caused a humanitarian crisis that is often met with oppression and exploitation. Most countries along the refugee routes deny forced migrants basic human rights. Somali people were fleeing the violence and famine in their homeland even before the civil war broke out in 1991. My father along with many other Somalis sought asylum in Denmark as early as 1989. However, with the growth in violence occasioned by the Ethiopian invasion of 2006, the exodus has severely increased. The majority of Somalis flee to neighboring countries such as Ethiopia, Kenya and Yemen. Somalis, who flee their homeland may be defined as forced or economic migrants by some nation states and refugees by others, who are willing to recognize often ill-defined violence as persecution. Forced migrants and refugees often flee the same violence, but the former have few rights and are sometimes given some form of subsidiary protection, so that the hosting nation will not be accused of sending the migrant back into a zone in which his/her life is at risk. If say a Somali is forced to migrate because of bandits that have cleared his/hers village, so they can take advantage of the food and livestock left behind, then how does one determine whether or not the migrant is, in fact, a refugee. The perpetrators could have been made free to commit such atrocities by the chaos created by a larger pattern of persecutions. Nevertheless, the indeterminate nature of violence can make it relatively easy for nation states to deny refugee status to people who are directly or indirectly victims of war and persecution. Most countries do not welcome mass migration, so they create legal barriers for Somali migrants. In turn, Somalis create and participate in a transnational community (diaspora) that operates to overcome these barriers. A worldwide network of money-wiring offices run by Somalis allows them to send money to friends and relatives even in the refugee camps. Meanwhile, organizations smuggle Somali migrants across borders and seas. The current approach to the humanitarian crisis in Somalia hinders organizations charged with the care of refugees and forced migrants from carrying out their missions successfully. Instead of being a temporary solution, Dadaab has become the largest refugee camp in the world and has been operated as a human warehouse for nearly twenty years. The current approach removes Somalis from the category of human through a discourse that selectively distributes human rights – rights that were supposed to be universal. Dette indlæg blev udgivet i About Somalia, Present og tagget dadaab refugee camp, Diaspora, human rights, Humanitarian crisis, migration policy den 9. december 2011 af Nasrin Billie. Dette indlæg blev udgivet i Risks og tagget Danish media, Laura Marie Sørensen, Rasmus Krath, Rasmus Tantholdt, Risks den 2. december 2011 af Nasrin Billie.